In the days of its glory, the Aztec empire covered most of Mezoamerica, and its cultural and religious influence spread far and wide. As the leader of the Aztec people you can now turn to gods to ask them for help. Use divine blessings and favours to outperform your rivals! 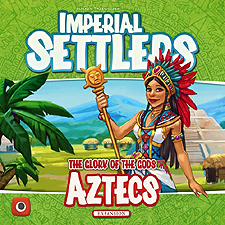 With the Aztecs expansion you will add a new faction and a religion mechanic to the base game of Imperial Settlers. When praying, all players can now introduce an element of risk to how they resolve their actions. Will you ask more of the gods?